The ideal place for study abroad programs, seminars, retreats, conferences and meetings. 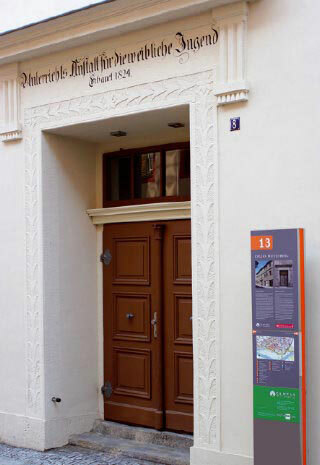 A historic building in the heart of Lutherstadt Wittenberg. All reformation sites at the front door, with a quiet backyard. The Colleg Wittenberg serves the need of affordable opportunities for study abroad programs, retreats, conferences and meetings. Colleg Wittenberg not only meets the requirements for inexpensive group-friendly accommodations, it also provides a unique opportunity to study in an historic environment. Colleg Wittenberg can provide housing for up to 48 participants with classrooms for seminars and lectures. Amenities include: a dining hall, laundry facilities, wireless computer access, bikes, a common room with Internet terminal and a TV with international channels, a kitchen and outside recreational facilities in the Colleg courtyard. Colleg Wittenberg is available to any educational institution and groups planning a study program, retreat or conference.